When Uber rolled out its new mobile experience in November it promised several new features such as transit information, Snapchat and Yelp integration, and the ability to enter a friend’s current location as a destination. Two of those features—Snapchat and “people are the new places”—started rolling out on Wednesday. The Snapchat filters are pretty standard, but allow you to use Snapchat without leaving the Uber app. The idea is that these filters will get you by while on-the-go in an Uber car. One filter, for instance, overlays your estimated arrival time on top of a photo. That’s similar to Snapchat’s current-time filter. There’s also a mystery filter that randomly changes. When The Verge tried it, the filter added a “golden cup” sticker with the Uber name on it. The really interesting new feature is the idea that you can specify destinations by person instead of an address. Driving to a person’s current location makes the app more social and somewhat more convenient. Instead of asking your friend where he or she is and then entering that into the app, you just tell Uber to figure it out for you. To use the shared location feature you have to share your contacts with the Uber app. The person you’re meeting also has to agree to share their location with Uber. Regular Uber users will get a notification from the app, while non-Uber users will get an SMS asking them to share their location. Once they agree, you can head towards their current location, and your friend gets an estimated time of arrival as you set out. The new features are rolling out now to Uber for Android and iOS. Why this matters: With its latest app update, Uber wants to be more social. But to be more social, Uber needs to know more about you, such as who your friends and colleagues are. That allows Uber to know your friend’s location, and it lets the company tailor future services to individual users. A new calendar integration, for example, helps Uber offer rides to your next meeting. 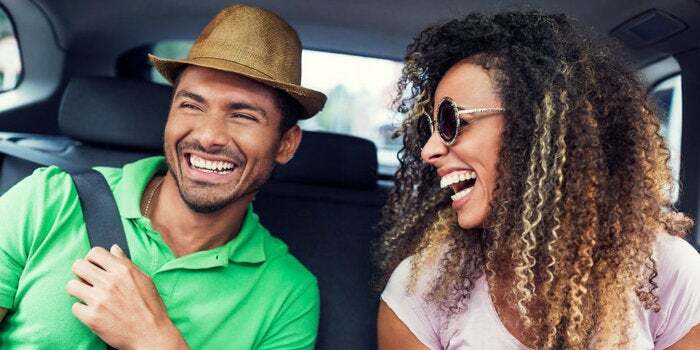 Those little conveniences, as well as new intelligent features that understand your regular travel destinations could please Uber's on-the-go customers, at least those who aren't particularly privacy-minded.